Guest post by Polly Pallister-Wilkins, Assistant Professor in the Political Science Department at the University of Amsterdam, The Netherlands. Her current research is concerned with humanitarian border policing practices in Europe. Polly’s latest publication, ‘The Humanitarian Politics of European Border Policing: Frontex and Border Police in Evros’ in International Political Sociology, explores the tensions of humanitarian actions and territorial policing efforts in Evros, Greece. When the Italian government instituted the Mare Nostrum operation under the auspices of the Italian Navy amid much European hand-wringing over the increasing number of deaths in the Mediterranean, the Italian Navy were cast as saviours coming to the aid of the helpless victims of evil smugglers. This was in contrast to a European border management regime headed by FRONTEX which indicated it wasn’t in the business of rescue and was thus characterised as uncaring. Following the deaths of 400 migrants between Italy and Libya last week on Tuesday, 14 April, and this past weekend’s boat capsizing with 700 migrants on board, the events in the Mediterranean still constitute an emergency―that is, a matter of life and death. Something has to be done and someone has to do it. Someone has to intervene, and it doesn’t really matter whom. Consequently, practices that would at another time seem excessive—the Italian Navy being deployed to rescue migrants in the Mediterranean—or evidence of state failures—such as private philanthropists engaging in search and rescue—suddenly became normalised or acceptable when the stakes are so high. This is the problem with emergencies—or rather, events framed as emergencies. They demand a response that moves us beyond politics and into the realm of exception, where such questions around what should be done, who should do it, or should anything be done at all, cannot be asked. Because who would not want to intervene to save their fellow human beings? In fact, however, most humanitarian emergencies aren’t in any real sense emergencies caused by sudden and unforeseen circumstances. The migrant deaths in the Mediterranean are not exceptional. Instead, they’re the result of particular policies instituted over time, such as the introduction of strict carrier sanctions and ever-tightening EU visa restrictions, or structural causes concerned with poverty and violence. Although the almost daily sinking of boats in the Mediterranean may be very real emergencies to those migrants who have little option but to exercise their freedom of movement in this way, viewing the events in the Mediterranean through the lens of exception conceals a restrictive European border control system at the heart of these deaths. This restrictive border regime, in turn, creates areas of operation for smugglers and places migrants at ever-increasing levels of risk. To see the migrant boat ‘crisis’ in the Mediterranean as a humanitarian emergency does a number of things. In addition to obscuring the underlying structural causes of such migration flows, it works towards the continuation of such a border control system while failing to take account of the fact that interventions to save lives and secure borders have the same practical effects. In studies of humanitarianism, scholars and practitioners alike have been keen to stress the fine line between care and control. FRONTEX, for example, claims not to be a search and rescue organisation and yet that’s what Joint Operation Triton has become, even by FRONTEX’s own admission, by rescuing 11,400 migrants in some 77 missions. Further humanitarian interventions in the name of a universal humanity, alongside more routine border policing efforts, work to reproduce the Mediterranean as European space. Humanitarian interventions are strategies of control and a form of border technology designed to stop an emergency and to restore the status quo: the continuation of an external European border regime that makes regular forms of migration for many non-Europeans all but impossible. As such, humanitarianism is an inherently conservative strategy. Through demands for immediate action enacted by emergency framing and the shift to the apolitical, interventions occur to restore order, to calm the seas, rather than reform already choppy European political waters. Questions around reform are political questions. In the context of an emergency, when people are dying and need to be rescued, it’s not the time to ask questions such as: Why is any of this happening in the first place? Those tasked with carrying out the rescues, such as the Italian Navy, are not the people to undertake such transformative and political tasks. Politicians, supported by European publics, need to make decisions and enact policies that would see a change to the current European border regime. This securing of migrant life in the Mediterranean Sea has another edge to it, in addition to its effect of policing migration and securing Europe’s borders from unregulated flows. Emergencies in the Mediterranean call for forms of interventions and interceptions that were already being performed by a variety of member state actors under the auspices of border control. The humanitarian emergency in the Mediterranean works to recast the net so that migrant safety and border security are framed as mutually achievable goals. Supposedly they have different ends: the former to save life, and the latter to police it. Practically speaking, they serve the same goal as they both enact interventions in order to intercept irregular migrant flows. Humanitarianism fixes the victim in time and space and doesn’t ask questions nor seek to get involved in the political area of what happens after people are rescued. For humanitarians, with their belief in universal humanity, this latter point is seen as belonging to the realm of rights and claims, and is the work of lawyers and politicians. Consequently, those rescued by the Italian Navy under Mare Nostrum, Joint-Operation Triton, or by the private philanthropy of the Migrant Offshore Aid Station (who’ve now teamed up with respected humanitarian practitioners Médecins Sans Frontières) end up in the same situation as those migrants intercepted by the Italian Coastguard; that is, in migrant detention facilities awaiting processing and access to their rights as political, fully human subjects—rights that extend beyond the mere right to life. There’s a great deal of criticism from various sectors of European civil society around European border control and migrants rights. There’s less concern over humanitarian interventions on the border and the rights of migrants during such interventions. In fact, some of those critiquing European border control are the same people calling for humanitarian intervention with the result that an already existing set of practices around border control becomes further entrenched, but this time with a humanitarian veneer of respectability—because who, after all, is against saving lives? Here, humanitarian border policing in the Mediterranean works to consolidate already powerful subject positions produced through earlier acts of intervention and earlier modes of border policing efforts. These humanitarian practices function alongside European border policing to produce the Mediterranean as a privileged European space and Europeans as powerful actors able to make decisions and stage interventions over life and death. Securing the Mediterranean for the preservation of human life requires actions that in turn necessitate a powerful subject: in this instance, Europe, or in the case of Mare Nostrum, Italy. Only the powerful can act to intervene to secure life. This is a key tension of humanitarianism: that while claiming to be a practice founded on universal ideals of humanity made up of equivalent individuals, it in fact requires powerful actors with the capacity to act to save lives; otherwise the intention to save remains only that, an intention. These interventions at sea are reminiscent of a number of earlier involvements such as the British Navy’s policing of abolition using gunboats and concomitantly securing the Atlantic for British imperial interests against the French. Moreover, away from practices that took place at sea, colonial history is littered with examples of humanity being invoked for the purposes of control, testifying to the imbrication of humanitarian and policing sensibilities in the genealogies of government. The solicitation of humanity in humanitarian action in the Mediterranean raises questions around which humanity is invoked and for what purposes. Who is the ‘our’ in 'Our Sea'—the literal translation of Mare Nostrum, which is how the Romans referred to the Mediterranean—for example? Is it the ‘our’ of a universal humanity or is it the ‘our’ of a territorial Europe engaged in the constant reproduction of European borders and the reproduction of European space? At the end of the day, the answer to such an intellectual exercise doesn’t really matter much, even if someone could answer it. 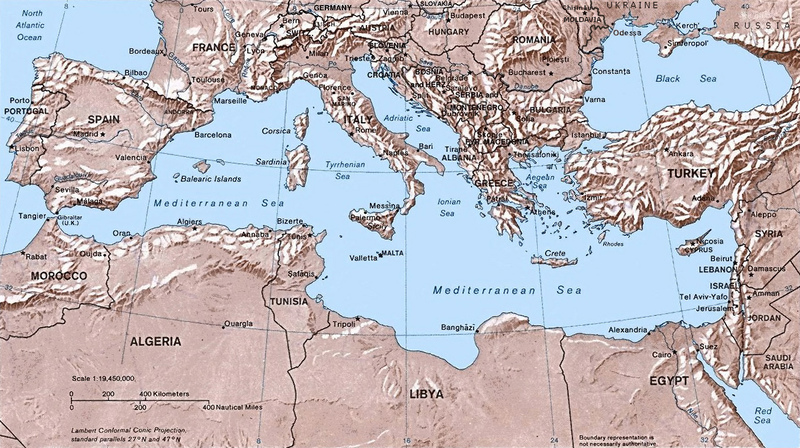 When we look at the results of practices that seek to secure the Mediterranean for human life and those designed to fortify the Mediterranean as an exclusive European space, we see that both rely on the same repertoire of intervention and incorporate the same sets of practices resulting in the Mediterranean being produced and reproduced as European space. Pallister-Wilkins, P. (2015) The Humanitarian Policing of ‘Our Sea’. Available at: http://bordercriminologies.law.ox.ac.uk/humanitarian-policing-of-our-sea/ (Accessed [date]).